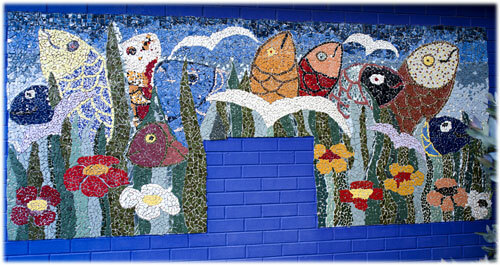 Community project was one of my early community projects that involved my art work (I did the design outline and assisted in mosaicking ). Five women and their children collected and broke tiles, pasted them on the wall. 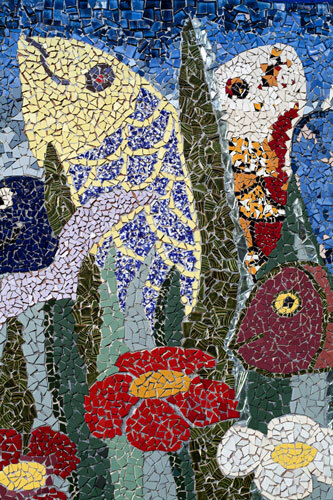 They had the creative license to use their colour and texture of choice. Where the empty rectangle is lived a hot water system. Photographer Genevieve Swifte took the pics and kindly sent me a copies. where was this wall Fern? At the units somewhere? ?